It must get hot under those cloaks. Do you ever feel like taking off your mask and revealing your identity? 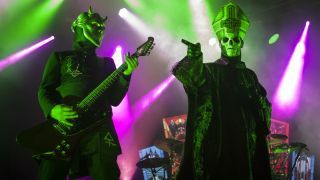 Who gets more chicks: Papas or Nameless Ghouls? So surely you must get jealous of Papa Emeritus. Do you ever think about overthrowing him and taking his spot in the band? And what is your most memorable groupie experience? So what’s the worst thing you’ve ever done on a date? What’s the weirdest thing you’ve seen while high? Have you got any phobias or irrational fears? What is the strangest thing a fan has ever given you? What was the moment you realised you’d made it as a rockstar? What’s the worst fight you have ever been in? What’s the worst enemy you’ve ever made? Who are Ghost and what do they want?